I felt like I could walk forever. 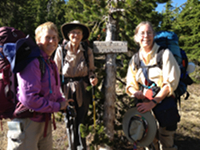 Last summer I walked 268 miles on the Oregon Pacific Crest Trail. It took me 26 days, which, if you are quick with math, averages about 10 miles a day. I started near the Oregon/California border at Callahan’s Lodge and ended prematurely at Ollalie Lake. I was headed for the Columbia River another 100 miles away. I was invited to tag along with someone who, though not the oldest hiker we met, was more than willing to challenge each potential competitor for that honor. Sometimes she lost, more often she won. It took months of gathering gear, food, maps, and bug repellent. My list included plenty of socks, long johns, hot cocoa for every breakfast, a collection of foods that took me about three months to dry and assemble, two 2-liter water bags, chlorine bleach to purify the water, a spoon, a cup, my sketchbook, and watercolor paints. What was not on the list was a change of clothes, soap, deodorant, a fork, or a pillow. I boiled water on a small stove to rehydrate my meals and hung my food to deter bears. Well, really it was to deter mice. The first day, after hiking about nine miles, I planted myself face down in the trail. I was unhurt, but I learned my lesson: Even when you are hot and tired, don’t forget to watch where you are going. The youngest member of our group said we became dumb and stupid that first day. The second day wasn’t bad, but the third day found us camping after only about eight miles. Inertia was the decider. We just couldn’t move on. Birds, trees, wild flowers, and mosquitos were our constant companions. Our brief encounters with through-hikers (Mexico to Canada) were the intimate jewels I looked forward to each day. Walkyrie, Pika, Charger, the Donald, Moonshine, Forever & Ever, Rattle-Bee, Calf, Little Brown, Brother & Sister, Barney & Daniel from Corvallis, and many more, added flavor to the days. We steadily acquired trail hardiness. Shoulders and hips no longer hurt from carrying a pack, even a rock under my sleeping pad couldn’t keep me awake, and routines became routine. It was then that I could enjoy the sights and let my mind wander to our ancestors who walked by necessity. I came to see walking as our evolutionary imperative. Days and miles passed as I walked alongside those ancient peoples. As I piled on more miles than I ever thought I could walk, I discovered the ease, the pleasure, and the naturalness of walking all day. I look forward to returning to the trail this summer to finish what I started. After that, who knows? Perhaps I will be inspired to take another long walk. France anyone?